Discount Coupons & Offers: Valentine special - 40% Off themed Hardcover Photo Books, with free gift wrap! Valentine special - 40% Off themed Hardcover Photo Books, with free gift wrap! Some people believe fairytales only exist in books – with Valentine's Day around the corner there is no reason why you can't create your own. With your favorite photos, capture your love story in the pages of a Hardcover Photo Book, now 40% off and in premium paper for a luxurious finish. Whether you are giving one as a gift or keeping it for yourself, the memories will bring a lifetime of smiles. Free gift wrap (with personalized gift card) if you place your Photo Book order before midnight, January 31 (a gift worth Rs. 150). Use code LOVEBOOK for 40% off all Hardcovers. Sale ends February 9, 2015. 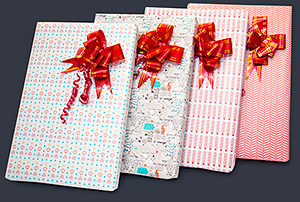 Free Gift Wrap offer ends January 31, 2015. Just launched! Desktop Calendars for your iPhone - Rs 99 only. • Offers valid till Monday, February 9, 2015 at 11:59pm IST. • To qualify for a free gift wrap, place your Photo Book order before January 31, 2015. • Offer valid on all Hardcover Photo Books, any cover finish, 20 pages only. • Apply coupon code in cart. • Cannot be combined with other offers/promotions. • Shipping charges and taxes applicable. • Readymade Photobook themes are available as Express Books or from the "Themes" folder in the product builder.